I've been trying to determine where the Erie's Dundee spur (today's NY & Greenwood Lake line) and the NYSW Passaic Branch met. As far as I know the Susquehanna ceased service to Dundee in the mid-1960s. Their bridge across the Passaic burned c. 1968 though I don't know if this caused the end of service or happened afterward. Did the E-L take over any of the NYSW trackage (and customers) after they left the area? part of the connection that crossed what was then the canal. 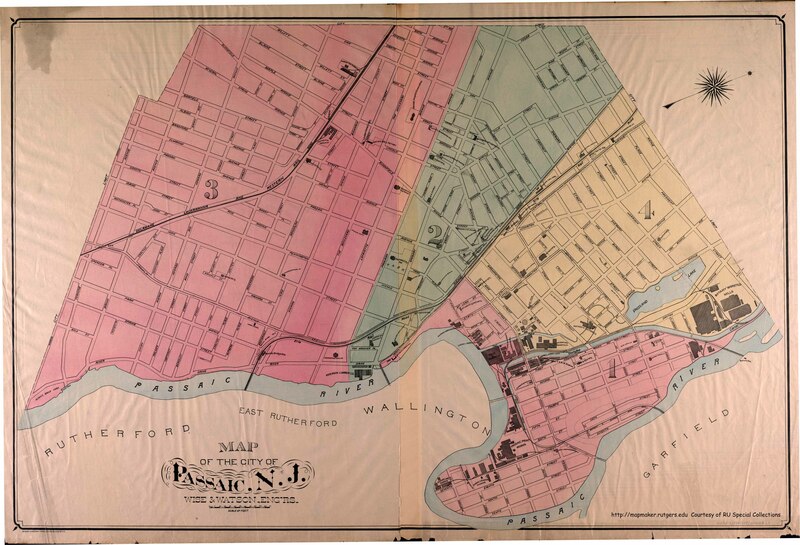 very cool site for historical maps! That neighborhood is virtually unrecognizable today, compared to what is on the historical maps. So much has been changed and torn down for shopping malls. Thanks for the maps, Carter. Rutgers is putting out some valuable information. I was at Canal and South Streets in November 2014, but I'm still not sure exactly whose service ended where and, again, if Erie/E-L took over any of NYS&W customers. A factory called Okonite was once served by both railroads.Very intricate track network for such a compact area, to be sure. is the NY&GL out of business? Or are they still serving the paper fiber shipper in Passaic? If you want to check up for yourself it is Atlantic Coast Fibers (ACF). They always answered all of my questions about thier railroad operations when I queries them back in the day when the paycheck I got each week read "Marcal Paper". Cute. I'm neither a customer nor a supplier of recycled paper products. The google maps imagery suggests they are no longer a shipper from that particular site, given the amount of vehicular obstacles on the ROW into their building. I think they have other sites. Too bad for the NY&GL. I was down in that area over the winter. There has been no movement of any rail equipment in a few years when the GE U34CH was removed from the yard. So no active customers. I think when the trash transfer place burned the second time that was the end. Years ago I asked the owner about selling a speeder also in the yard but was turned down. It still sits there today rotting away with the rest of the equipment. Sad to see. Does anyone know if Atlantic Coast Fibers still has usable/intact a rail connection? I read this thread indicating no service for some time, but, are the tracks still in place and serviceable? Yes the tracks are still all there !!!! But they ship everything in containers to china now!!! I understood they brought fiber [used paper/cardboard] in by railcar and repackaged the fiber into containers which were trucked to Port Newark. I asked because I was wondering if anything that Cavossa Disposal is going to start shipping via rail off of Cape Cod could possibly come by rail to Atlantic Coast Fibers. Stolen from the Mass Coastal thread in the "New England Railfan" section. Atlantic Coast appears to recycle quite a range of items. It looks like it might work, but, I may be missing something. Just a thought. Just passed through there last week. The 2 GPs, FA, and a few cabooses/NY&GL boxcar and passenger cars are all still there. It looked like someone has been painting over any graffiti that gets tagged on them. The two stall shed/waste transfer building looks full of recyclable metal on one side, with a heavyweight passenger car of some sort sticking out from the other bay. According ot the wiki page the transfer station was shut down when their price was undercut significantly by someplace in newark. I'd be surprised if these tracks came back from the dead. That FA-2 one of the former LIRR power packs? In the Youtube video of the U-34CH getting pulled out by the M&E Century 424's, it looked like #610 or #616, very faded.